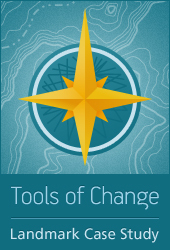 Tools of Change helps you quickly learn from proven social marketing / behavior change approaches in a wide range of environment, health and safety topic areas. We feature the best ones we can find. In two topic areas - energy and transportation, we go one step further with our Landmark designation process. Designation through this peer-selection process recognizes behavior change approaches and programs considered to be among the most successful, innovative, replicable and adaptable in the world. On this site, their cases studies are indicated by the gold and teal-blue compass icon below. Nominations are screened by Tools of Change staff and the most promising ones are then rated by peer selection panels based on a standard scoring grid. Designated programs are highlighted in our webinars, transcripts and video recordings from the webinars, and written case studies. Designated programs gain additional recognition, exposure and credibility, which may help them attract customers and investors, and maintain or increase program funding. They also get a Landmark designation logo for use on websites and in electronic newsletters, providing click-through access to the program's case study materials. Tools of Change is now soliciting nominations for its 2019 Landmark behavior change case studies in two topic areas - (1) energy conservation and (2) sustainable transportation. If you know of anyone working on a particularly effective, innovative or impactful approach for changing energy or transportation behaviors, please consider nominating them - or yourself. All nominations must include measured impact results. The Nominations Form must be submitted by June 3, 2019. Designations will be announced by October 2019.